Gandy Granular Applicators mount on most planters, whatever the brand, so you can be sure your application needs are effectively met. 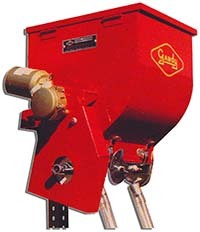 Typically used for applying low rates of Diazinon or Lorsban, Gandy Material Applicators feature patented cam gauge metering with precise flow rates. Drive can be supplied by the planter drive shaft, or independently by an electric motor. Optional Ro-Banders can be used to disperse material in 5-inch, 7-inch, and 10-inch bands. 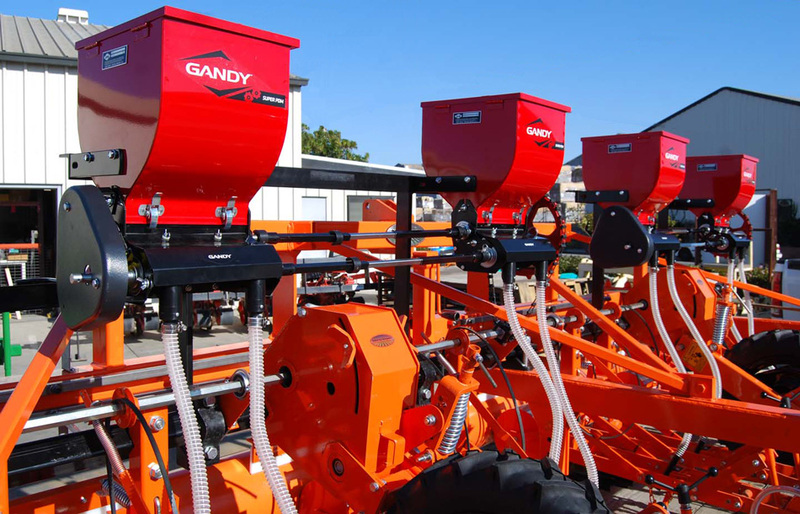 Gandy's row applicator system offers positive material control, while still providing very accurate speed compensated rates. By employing the use of positive displacement metering wheels, material flow is shut-off immediately when the drive stops, eliminating dribble and waste. 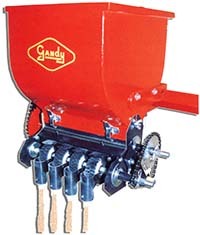 Gandy applicators and accessories are not available in our online store, but can be purchased by phone: 866/280-6229. Most in-stock items are shipped same day. Gandy Super Applicators on a Stanhay S870 belt planter. (click to enlarge).